The Tennant S30 is a large, industrial grade, self-propelled, ride on sweeper, manufactured in the U.S. The Tennant S30 can be configured for use in indoor or outdoor environments. This floor cleaning machine takes heavy duty cleaning to a new level to dramatically reduce dust and debris in your manufacturing warehouse, parking lot, or other application. The Tennant S30 ride on sweeper picks up all debris from fine sand to light litter on almost any surface. The side broom on the S30 rider sweeper directs debris into the path of the main broom. The S30 main broom throws debris forward from the floor in to the debris hopper. A large vacuum fan pulls dust into a highly efficient three stage dust control system called “SweepSmart”, and clean air is exhausted. At the recommended operational speed of 5.0 MPH the S30 rider sweeper cleans at the rate of 122,000 square feet per hour. This industrial floor sweeper is one of the preferred sweepers in the cleaning industry for warehouse floors and manufacturing facility floors. To reduce dust and improve working conditions, the S20 is a reliable sweeper that promises cleaner floors, better quality air, and safer warehouse/manufacturing employees. Simple manual broom levers raise and lower all brooms, and are within easy reach of the operator. Both side brooms and main broom turn off when the broom levers are raised. A broom wear indicator is located on the main broom idler assembly. This indicator lets the operator know when it is time to replace the main broom. Tennant’s “SweepSmart” dust control system is another unique feature that provides three air filtration stages. Stage one-“Perma-filter” is a grid on top of the debris hopper and protects from flying debris. Stage two is a series of cyclonic filters which remove fine dust and moisture, redirecting into the debris hopper. Stage three completes the air filtration removing submicron dust down to 0.5 microns. Stage three consists of a flame retardant, nanofiber canister (cylindrical) filter. Debris hopper on the S30 rider sweeper can be emptied at any height up to 60 inches. At full capacity the S30 rider sweeper debris hopper can hold up to 14 cubic feet of debris. A hydraulically controlled rear hopper door contains debris during transport. 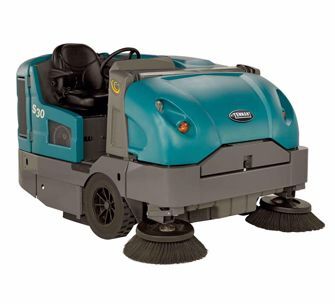 The S30 rider sweeper is available with optional dual side brooms for a category leading 80 inch cleaning path. Add the optional vacuum wand and clean tight corners and hard to reach areas. Other popular options for the S30 are the pressurized cab with heat and air conditioning, and safety light package. The Tennant S30 Parking Lot floor sweeper, especially the gas, LPG, and diesel options, will give your parking space a heavy-duty clean that’s also highly efficient. Ideal for parking lots and parking garages, this machine will pick up many sizes of dirt and debris from fine dirt to nails, screws, and broken glass. With the cleaning power of the Tennant S30, your business will effectively maintain its outside appearance, increase employee and customer safety, and preserve parking lot strength and quality.